INDIANAPOLIS, Indiana – A new, boutique steakhouse with a superior reputation is coming to downtown Indianapolis. Keystone Realty Group announced today a deal to add Hyde Park Prime Steakhouse to the development of the Illinois Building located at the Southeast corner of Illinois and Market streets. This marks the second restaurant in the redevelopment of the property just one block from Monument Circle after Keystone announced Giordano’s pizzeria will open on the first floor this November. 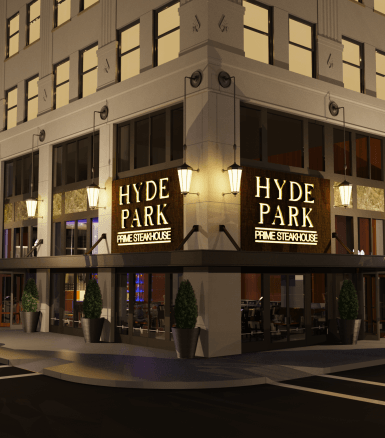 Hyde Park Prime Steakhouse plans to open in the first quarter of 2016 with 200 seats occupying more than 8,000 square feet on the corner space of the Illinois Building’s total square footage of 150,000. Downtown Indianapolis is the first location for the Cleveland-based Hyde Park Restaurant Group in Indiana. Founded in 1988, the company operates 16 high-end steak and seafood restaurants nationwide located in Ohio, Pennsylvania, Michigan and Florida. In addition to Hyde Park Prime Steakhouse, the company operates Jekyll’s Kitchen, eleven, ML Tavern and Black Point Prime Steak & Seafood. The Illinois Building was originally built in 1926, but has remained empty for 13 years. In 2007, it was listed among the “Ten Most Endangered” properties according to Indiana Landmarks before it was purchased in 2014 by a related entity of Keystone Realty Group. Keystone’s plans call for Hyde Park Prime Steakhouse and Giordano’s pizzeria to be located on the first floor with an indoor/outdoor rooftop bar and restaurant on the 11th floor. An upscale hotel has been proposed as the potential anchor of the Illinois Building, but discussions continue and a deal has yet to be finalized. “The Illinois Building is an important part of downtown Indy’s history, so we want to be careful to make the best decisions for our investment in the property, and for the potential to generate significant economic development for the City and the State while creating jobs for more than 250 Hoosiers,” said Ozdemir who is also the owner of Indy Eleven Professional Soccer of the North American Soccer League. Legislation enabling the construction of a new, 18,000-seat stadium to serve as the home of Indy Eleven is in the final stages of consideration by the Indiana General Assembly. The overall cost of the stadium would be financed through user fees captured at the stadium and, if necessary, the Illinois Building development. House Bill 1273 would extend a sports and entertainment development area to include a future multipurpose stadium site and the Illinois Building development for the purpose of reinforcing stadium finances. Founded in 1988 by Rick Hauck and Joe Saccone, Hyde Park Restaurant Group is a privately held company headquartered in Cleveland, Ohio that employs 650 associates and operates 16 restaurants located in Ohio, Michigan, Pennsylvania and Florida. With an emphasis on fine dining, their restaurants include Hyde Park Prime Steakhouse, Jekyll’s Kitchen, eleven, ML Tavern and Black Point Prime Steak & Seafood. For more information, please visit www.hydeparkrestaurants.com.